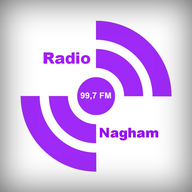 Radio Nagham is a local radio broadcast of a Palestinian identity from the center of Qalqilya. Radio Nagham is one of the most famous online radio station on Palestinian. Radio was able to tune since it was founded in 1995 by establishing her place. And was able to attract an audience has been Tazzhma and evolve, making it at the forefront of local radio stations in the provinces of the northern West Bank. And Salfit and cover 80% within the Green Line.